When I say Thai food is one of my favourite cuisines, I’m not lying. When I visited Thailand back in 2013 I fell in love with the food, and I have always craved the delicious taste of traditional Thai street food since returning home. There’s nothing quite like the flavours and texture of Thai, and there’re are many reasons why I love it so much. When I was invited to The Giggling Squid in Bishop’s Stortford to test out their menu I was so excited to tuck in! Jordan and I visited the Bishop’s Stortford branch on a Sunday evening and was pleasantly surprised to see the restaurant pretty full of tables of people enjoying their food. Normally on a Sunday restaurant’s are pretty quiet, especially the weekend before payday, but people seem to like it there! We were greeted by the friendly host and were seated at a table of two right by the window (so we could enjoy the view/ people watch as they wander past the restaurant). The restaurant was beautifully decorated with lots of pale, pastel colours and floral designs. The waitress came over straight away to ask if we wanted any drinks and Jordan ordered a Chang beer (I was obsessed with it when I visited there!) and I opted for a soft drink, an elderflower tonic (which was really refreshing). The we deliberated about what we were going to order for what seemed like a very long time. You know when you go to a restaurant and you look through the menu and you literally want to order everything? Well yeah, this was the predicament here. It was a very hard decision to choose what we wanted to eat, especially as it was our first time visiting, we hadn’t tried anything before. Anyway…. for starter, Jordan ordered the soft shell crab, and I ordered the duck spring rolls. Both these starters were around the £7.50 mark which although seems quite pricey, is actually completely reasonable for what you get. 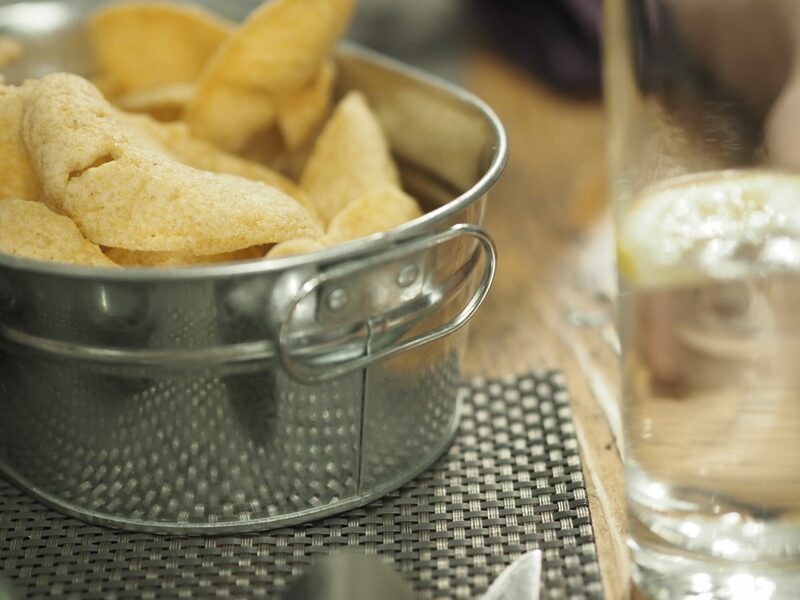 And whilst we were waiting for our starters, we saw people tucking into a pre-starter of prawn crackers and sweet chilli sauce, so of course we had to add a sneaky order of them too! and let me tell you, they did not last long at all! Jordan thoroughly enjoyed them, as did I. Well the starters were amazing! 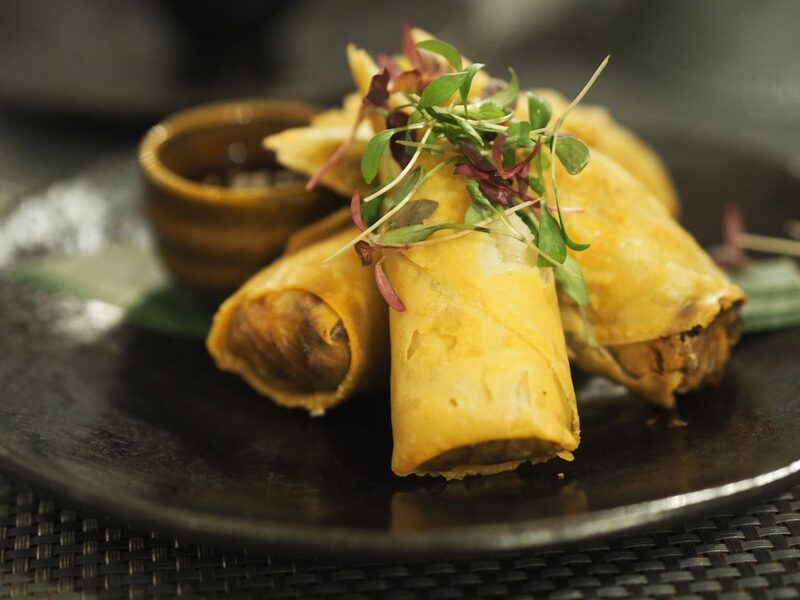 When the Front of House brought over my duck spring rolls, he made me aware I had the last order of these so I was pretty pleased I got in there quick. They were crispy and had great texture as well as being full of flavour! Jordan’s soft shell crab also looked amazing, he said it was really good and would definitely order that again! Now on to the mains. As I said before, it was so hard to choose between all the options on the menu, but I decided to go for something I knew I loved and would enjoy. 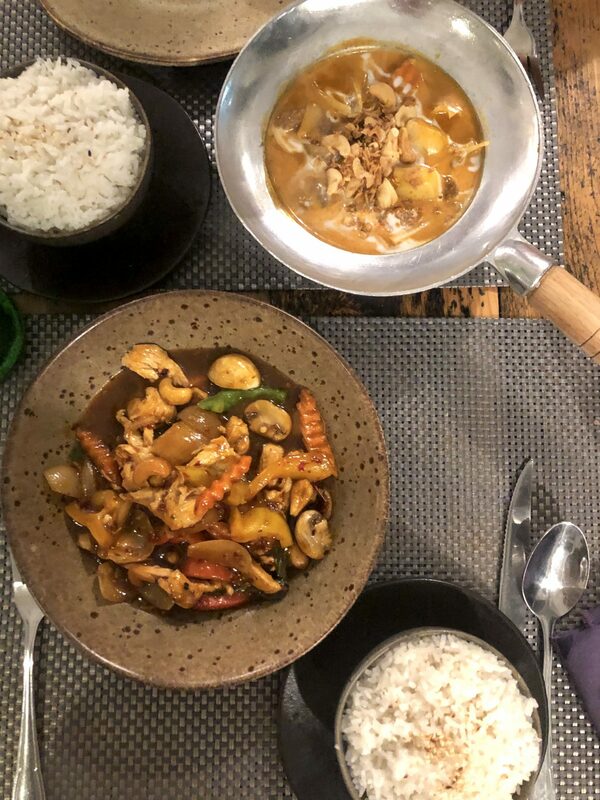 I chose the chicken cashew stir fry with a side of coconut rice (because coconut rice is life) and I recommended the beef massaman curry with again, a side of coconut rice for Jordan! When the dishes came out, the aromas were unreal, really brought back memories from being in a local Thai restaurant surrounded by good food. The smell of the massaman curry is really exquisite, it’s a A Muslim style curry from Southern Thailand, and made with coconut milk and dry spices such as cumin, cinnamon and star anise. So you can imagine the smells were insane! I love coconut anyway, so I was particularly excited to taste a bit of Jordan’s main, and I was really impressed at how good it was. It tasted just as good as the local food in Thailand and made me was to book a a holiday there instantly. My chicken cashew curry also smelt devine. I was pleased to see the dish wasn’t dry and came with a delicious sticky sauce to blend everything together. I love how the cashews and the crunchy veg added texture to the dish. The coconut rice was fluffy and sticky and was just as good as I remembered it to be. I could eat coconut rice every day! These two dishes were not badly priced at all. They were both around the £10 mark and then the rice on the side was another £3.50 so together it was really reasonable. It was nice that they had a range of dishes available on the menu for different prices, but I’d say you’ll be looking to pay around £15 for a main, but there were some more expensive options. We were stuffed after the starter and main, as we literally cleared our plates, so we were actually going to skip dessert. But we decided to see the menu anyway – as you do. And then the foodies within us could’t resist to order one. 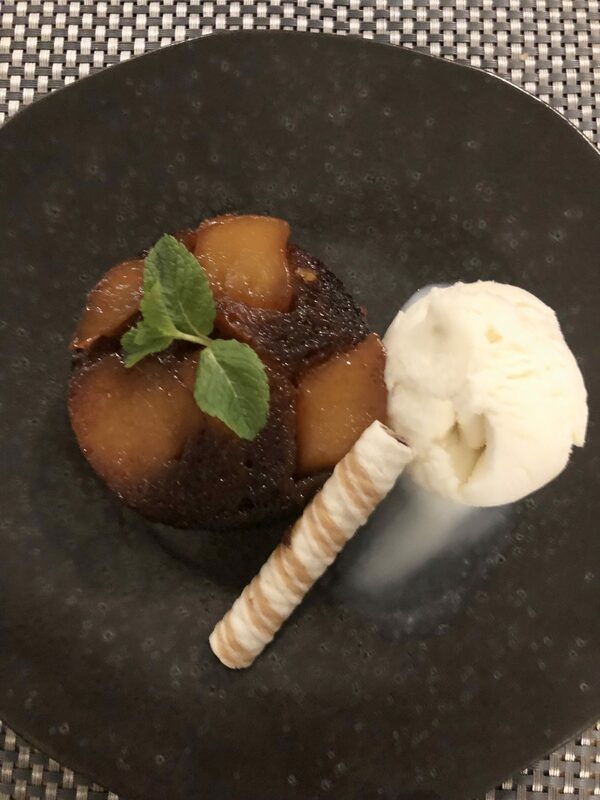 Unfortunately, there were a couple of desserts that were unavailable, one of which I would have like to try, but that just makes an excuse for us to go back. But we decided to go for the caramelised mango cake, something i’ve never tried before and was a bit different to what I’d normally go for. We shared this as we were so full from the other meals, but it was totally worth expanding our stomaches for! The cake was super sweet and tasty and the ice cream one the side was smooth and creamy, and accompanied the cake perfectly! I always say that if I would return to the restaurant, then to me it was a good experience and I liked it, and I am already thinking about when I can book to go again. I want to try out more of the menu (all of it if poss) and enjoy the nice atmosphere there. The service was great, the food was tasty and overall it was a really enjoyable experience. 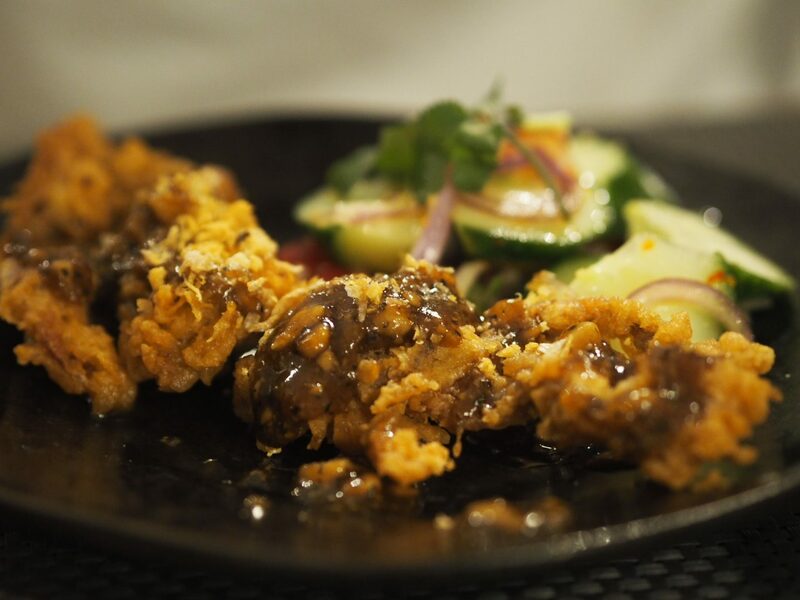 If you are a huge fan of Thai food, or even if you wanted to try it out for the first time, I would 100% recommend one of the Giggling Squid restaurants. You are guaranteed to have a good time and taste really good Thai food! Have you been to one of the restaurants before? If not would you like to go? I haven’t had thai food in ages and could do with some right now. the interior looks incredible and the food looks amazing too.